I used to cook this a lot with someone and I’ve recently remembered it again because it’s a little time-intensive but very good. I never measure my things, so take the measurements with a grain of (haha) salt. Note the lakes of juice and cheese fat. For you fatophobics: That’s the grease you won’t be eating, so all’s good. Cut the zucchini lengthwise and hollow them out as best you can by scraping out the flesh using a sharp spoon. Make the zucchini walls as thin as possible without breaking them, so baking won’t take forever later. Keep the zucchini flesh and chop it into small pieces. Cut the cherry tomatoes in half. Chop the garlic finely. Grate the cheese(s). Chop the onions into small bits. Heat olive oil to slightly less than medium heat. Add the onions, fry very slowly for 5 – 10 minutes without letting them get too brown or black. Add the garlic, paprika powder, peperoncini, salt, pepper, oregano and basil. Mix with the onions for 30 seconds to make the flavors come out. Then add the zucchini flesh and cherry tomato halves. Raise heat to medium-high. Cook while stirring occasionaly until the tomatoes have broken down and the mixture has a thick, jammy texture. Preheat the oven to 180ºC. Put the zucchini halves on a baking tray, on top of baking paper. 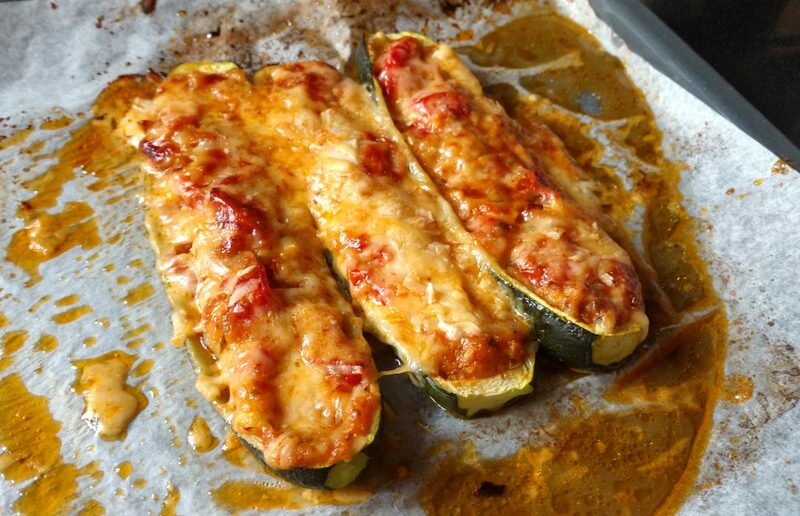 Fill each halved zucchino roughly to the brim with the cooked mixture and sprinkle parmesan and goat cheese on top. Bake at 180ºC in the middle of the oven for 30 – 40 minutes. Keep an eye on the cheese, don’t let it get too dark. Serve with dry white rice, rösti, pan-cooked potatoes, hash browns, that kind of stuff. Enjoy! Necrophobic. I saw them live a few years ago but somehow didn’t realize they’re this interesting. Bought Mark of the Necrogram, but they have a sizeable backlog I now have to work on. Unfortunately, they don’t seem to be on Bandcamp so I had to buy from one of the evil empires (Google in this case). Slægt. A sort of blackened heavy metal from Denmark. I don’t like all the songs but the style mixture is compelling. Slægt on Bandcamp. Desaster. A thrash and black thing? Maybe. It’s a bit straightforward for the most part so I haven’t bought any albums just yet, but they had a very energetic stage presence so the show felt great. If they’re at some other festival or on a solo tour I’d definitely consider going. Wiegedood. Can’t decide if it’s plain black metal or if they’ve mixed a harsher type of shoegaze into it. Think of a heavier Alcest song played on a slightly broken amp that you run too loudly. Usually I find more bands at EMM, but this time it was almost impossible to watch any acts on the small stage because everything was so packed with people. This is a shame, as it’s the small stage that has the more underground stuff and I’ve discovered at least 10 groups there in the last two years. Of course you can always watch some of the more interesting-sounding parts of the lineup on YouTube, but that’s so not the same. Oh, well. And restart NetworkManager (systemctl restart NetworkManager on e.g. Debian 9). With MAC scrambling enabled, the interface came up for me but failed to authenticate. The solution is from this issue on GitHub. I can’t remember where I found this, I’m pretty sure I didn’t figure this out for myself. If you need a DolphinBar, Aliexpress should have you covered. It could be that the vendor code differs for yours, so make sure to watch dmesg when you plug it in.